Evelin Rosic was Born in 1979 in Sarajevo, Yugoslavia. He was the child of two hard-working parents, living a life in one of the most culturally diverse cities in the world. His father, Jacky, was from a Muslim heritage, his mother Anna from a Catholic tradition. Sarajevo is famous for its traditional cultural and religious diversity, with adherents of Orthodoxy, Islam, Judaism and Catholicism coexisting there for centuries. Until the early 1990's, it was the only major European city to have a mosque, Catholic church, Orthodox church and synagogue within the same neighborhood. From this union of differing cultures and traditions, Evelin Rosic was born. The Rosic family struggled, as many families do, but life at home was healthy and happy. The diverse backgrounds of both his families exposed him to a wide range of art, music, and culture. It was during this exposure to all things art and music that young Evelyn thrived. An artist was not only born but incubated with love and exposure to the best blend of classical and modern art. Evelin Rosic spent his first 12 years of life in a suburb of Sarajevo. He had his first art exhibit there. It was at a local hospital. He painted birds on the wall to take his mind off the pain of the needles that shot pain into his behind and those of many other children. (Do not try to commission him to paint birds as he still equates them with pain to this day.) Unfortunately, war would eventually shatter the life of the Rosic family and tear apart Evelin's childhood. The religious diversity of this great city ultimately exploded into civil war after the collapse of Yugoslavia. In 1992, Sarajevo found itself at the heart of a religious and ethnic civil war. During the war, the Siege of Sarajevo was the longest siege of a capital city in the history of modern warfare. After being initially besieged by the forces of the Yugoslav People's Army, Sarajevo, the capital of what became Bosnia and Herzegovina, was besieged by the Army of Republika Srpska from April 5, 1992 to February 29, 1996 (1,425 days) during the Bosnian War. The siege lasted three times longer than the Siege of Stalingrad and a year longer than the Siege of Leningrad. Because of their diverse backgrounds, the Rosic family was welcome on neither side of the civil war that would tear apart their country. His last memories of the land of his birth are far from pleasant. Shuffled from safe house to safe house, the family hid from religious and ethnic persecution from all of the warring parties. The monies and family savings now had to be passed into the hands of strangers in the hope that the family could be guided them to safety outside the ountry. Loss and danger were everywhere. With everything they could take with them, the Rosic family packed into a small car and rode a gauntlet of bullets and bombs to the Austrian border. During the conflict it is estimated that the City's population fell from an estimated 525,980 to approximately 300,00 to 350,000 after the war. Family members from one side of his family were fighting and killing family members from the other side of the same his family. In these are memories of darkness, fear and pain. Survival was a struggle, the future anything but secure. Eventually the Rosic family made their way to Germany where they were allowed asylum while war continued to tear apart their home and extended family. Evelin and his family emerged from this darkness into the light of Ludwigshafen, Germany. It was 1992, Evelin, barely now a teenager was impressionable and reborn into a new emerging world of hip hop culture and dance that had made its way across the ocean from the United States. In a new land with new friends, Evelin would create a new identity. In homage to one of his mentors Tony Der Assi (whose graffiti moniker was "Paco"), Evelin Rosic became Paco Rosic. He joined the infamous b-boy dance group known as the Unique Wizzards who danced as back-up for many major American hip hop acts that toured Europe. Paco was so talented as a dancer, dancing turned competitive. He competed in underground hip hop clubs and jams throughout Germany. In the tradition of "Zulu Nation" born from the New York hip hop scene, Paco's talent as both an artist and dancer exploded. Germany felt good. But Germany was not to be the final stop for Paco. The war ended in Bosnia and with it the Rosic family's asylum in Germany. After the war ended, again the Rosic family again faced an uncertain future. They had to leave Germany but would never be welcome back home due to the religious turmoil that still permeated throughout their homeland. "You learn to live for just tomorrow. Without identity. Without country, " Paco says. With time quickly running out and no place to go, the United States offered the Rosic family a life preserver, another chance to rebuild. President Bill Clinton issued an executive order that would provide a path for families such as the Rosic family to legally enter the United States as refugees. The Rosic family still expresses love, gratefulness, and admiration for President Clinton and what he did for their family and other families like theirs. He threw a life preserver to a drowning and adrift group of people. The family is forever thankful. After clearing immigration hoops in New York, in September of 1997, the Rosic family landed in Waterloo, Iowa. Waterloo had quietly established itself as a center for Bosnian refugees from both sides of the Civil War. A large Bosnian community still thrives in parts of Iowa, especially Waterloo to this day. Ripped once more from his friends and security, Paco fell into depression. The family, twice knocked down would once again face struggle. Twice ripped from happiness, twice ripped from everything he knew as home, Paco was thrown into a strange new world with a new, unfamiliar, language. He holed up in the family home for months, rarely leaving. The family's savings had been yet again savaged by being uprooted. Paco's parents again worked long hours with low pay as they tried to make the best of their new home and rebuild a life for the third time. In the isolation and loneliness of a new place that seemed nothing like home, Paco turned to graffiti, an art form of powerful color and expression he had picked up from his German friends. Painting became a means of survival. No longer painting publicly or illegally "tagging", Paco started to evolve his aerosol street art into a more traditional setting creating something entirely new and exciting. His art was a blend of the powerful and edgy street art of graffiti with the traditional art he was exposed to as a young child. Tradition met with hip hop and a new type of art emerged blending the best of both worlds. One can see the the great influence of Pablo Picasso's painting of the horrors of war from his epic painting Guernica, side by side with the expressive street works created by underground hip hop artists in Paco's work. A lack of money for traditional canvass found Paco purchasing sheets of Masonite on which to express his pain and despair in a way to try and create an identity in his new home. 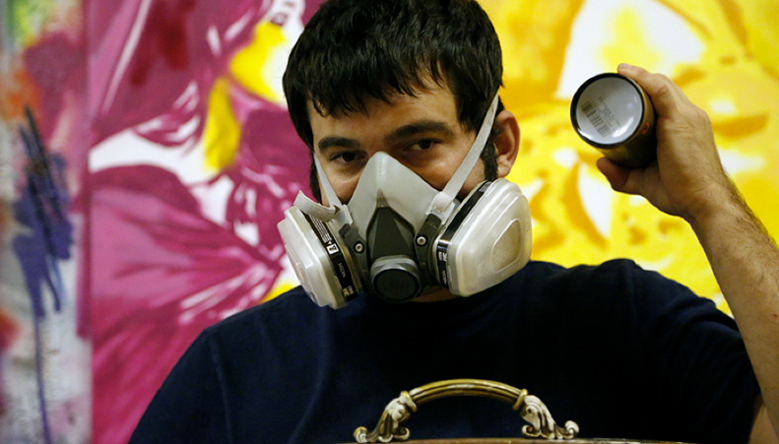 Paco eventually shared these paintings with instructors at a local community college and soon the word got out about this young Bosnian spray paint artist. Many of these Masonite paintings found their way in to restaurants and taverns throughout Eastern Iowa and are still there providing lasting reminders of Paco's heavy impact on the area. Paco was again resurrected from hopelessness and loss. For three years he developed his technique and worked on community projects including painting trucks and walls of abandoned buildings as city works projects (this time legally). His work became the center of public discussion when he was commissioned to paint the interior and exterior of a building in downtown Cedar Falls, Iowa. The public discussion worked to Paco's benefit as the local newspaper, The Waterloo Cedar Falls Courier, displayed his work on the front page of their Metro section. Paco turned now his attention to bigger dreams. Always inspired since childhood by the story of Michelangelo's struggle with the Pope and the resulting masterpiece on he ceiling of the Sistine Chapel, Paco envisioned the Sistine Chapel redone with aerosol. With his family working at a local grocery store and his father coming from a work history in food inspection and the food industry, an idea was born. Create a destination restaurant with the art of the Sistine Chapel as its centerpiece. The family poured its savings, sweat,tears,and soul into a worn out, long abandoned, building in downtown Waterloo. Doing most of the reconstruction themselves, the breathed new life into this shell of a building. What would eventually emerge after long hours of backbreaking work, would be a canvass for Paco to paint his dream. He now had a canvass upon which he could recreate Michelangelo's masterpiece. Long, lonely hours turned into weeks. Weeks turned into months. Fueling himself with pizza and Red Bull, Paco tirelessly worked to create his dream. After almost five months, a classic masterpiece from the Renaissance was reborn in Eastern Iowa. After the ceiling was completed, Galleria de Paco opened its doors to wide national acclaim. Paco's masterpiece was splashed onto the front pages of newspapers across the country. He was now on the front page of the Los Angeles Times and Chicago Tribune. ABC Nightly News came to Waterloo to document his accomplishment. Galleria de Paco has become became a tourist destination for people throughout not only the country, but the world. In 2008-2009 floods ravished Eastern, Iowa. Galleria de Paco was not spared. The flood meant closing the restaurant. It meant that employees no longer had jobs and once again the Rosic family faced adversity. Hard, backbreaking work was needed to repair the damage left by the flood. The problem was that the life savings that created the dream of the restaurant business was gone. There was no money to hire staff and rebuild that which the flood had taken. Jacky and Anna, Paco's parents, were prepared to give up on their dream restaurant and move on to something else. Fortunately, Paco was not. But what to do? Where would the help come from? How could they get back on their feet? Simple, Paco reinvented himself from artist to chef. His dream of being a full-time artist would have to be sacrificed for the family's benefit. The creative brilliance that was expressed through art was now put to work saving the family dream. The Rosic family rebuilt the restaurant. Out of necessity, Paco re-emegered as the head chef. Erotica, portraiture, paintings of Hollywood icons, and amazing renderings of scenes in Europe would temporarily take a back seat to racks of lamb, shrimp and grits, and and other amazing kitchen specialties. After a number of years of success in the restaurant business, Paco is now poised to return to art world with the same passion, aggression, and creativity that has marked everything he has ever done. With the mission accomplished at the restaurant and the family's financial health returned to a place where they can afford to hire someone else to take Paco's place, he is poised to return to his true love, art. His vision for his art has not changed. Paco uses his art as a bandage for the wounds of his life. He proclaims that most inspiring part of his art is that he does what he wants to do, not for commercial exploitation, but as a means of self-expression. "An artist ideally paints what he wants to paint, you paint for yourself and hope that others like it rather than painting for others hoping they will like it too." He paints to heal. He paints to cope. He paints to survive.